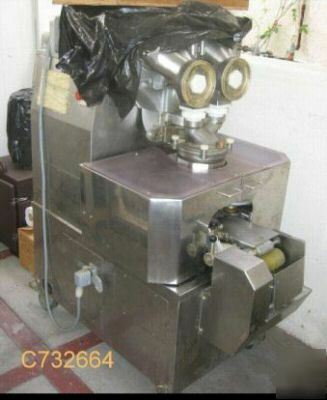 Rheon Cornnucopia Encrusting Machine, Model KN200. Constructed of stainless steel and food grade plastic product contact parts. Unit designed for 2 parts encrusting of product with a capacity of up to 60 pcs/min, product weight range of 10 grams to 300 grams. Electrical 220 volt, 3 phase. Mfg in 1993, approximately only 800 hours of use and is in excellent condition. Stock No. C732664.